SMS Towage host 2018 Grimsby and Immingham Shipping Association Dinner in support of the Viola Charitable Trust - SMS Towage Limited. The 2018 annual Grimsby and Immingham Shipping Association (G.I.S.A.) Dinner was hosted by SMS Towage for the first time on Friday 7th September. 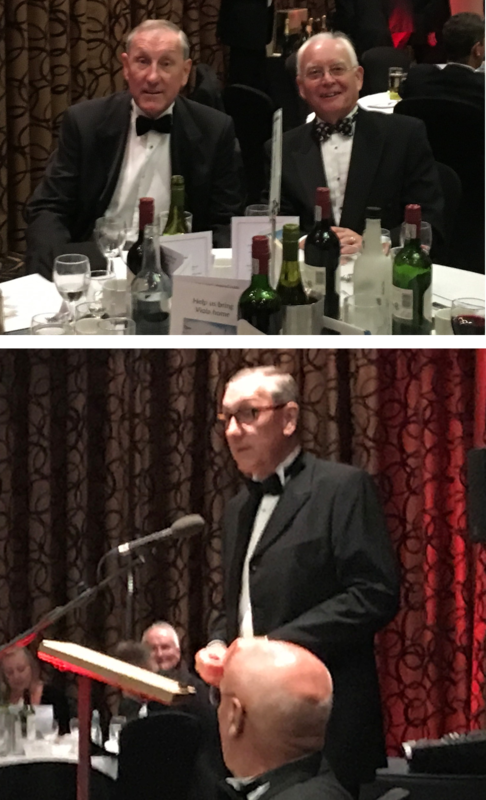 The evening featured an opening speech by the Chairman of SMS Towage Paul Escreet, an after dinner speech by former England captain Terry Butcher and entertainment by comedian Gary Marshall. SMS Towage has been a regular atendee of the annual dinner, which in celebration of the local shipping industry community. Over 230 guests attended the evening, which proved to be a popular and enjoable occasion. The order of the evening began with an opening speech by Paul Escreet, Chairman of SMS Towage and trustee of the Viola Trust. Before dinner, the port chaplin of Immingham, Fr Colum Kelly said grace. Former England and Ipswich Town captain Terry Butcher held an after dinner speech and Q&A session, staying late into the evening sharing annecdotes from his footballing career. Finally, Comedian Gary Marshall rounded off an evening of entertainment with an hour long comedy set. On the night, a substantial amount of money was raised for the Viola Trust, a charity dedicated to restoring The Viola, which is thought to be the oldest surviving steam trawler. The Viola was built in 1906 in Beverley, UK and was initally part of the Hellyer fleet on the North Sea. In 1914, she was requisitioned as an armed trawler, spending the four years of the war clearing mines and fighting U-boats. If you would like to find out more information or donate to The Viola Trust, please visit http://www.violatrawler.net/.